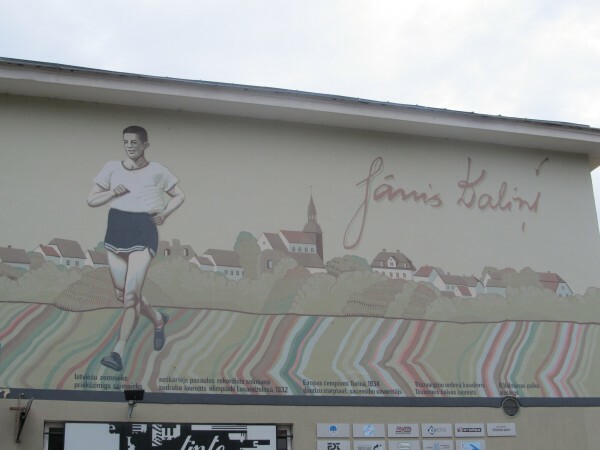 A wall mural honoring Valmiera sports legend Jānis Daliņš. Photo: Philip Birzulis. 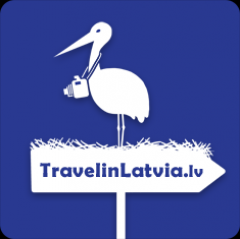 Latvians Online is pleased to announce a new column about travel in Latvia – unusual destinations and the gastronomic delights they offer. Flattened by frequent wars and smudged by heavy industry, Valmiera is not a beautiful looking place. But what this city of 25,000 in the heart of Vidzeme lacks in prettiness it more than makes up for with a winning attitude. Take sports. To date, Valmiera’s athletes have brought home two Olympic golds (courtesy of BMX rider Māris Štrombergs in 2008 and 2012) plus a silver and bronze (for walkers Jānis Daliņš and Adalberts Bubenko in 1932 and 1936 respectively.) Add in a slew of medals won for Germany by champion dressage horse Rusty, born and bred near Lake Burtnieks just north of Valmiera, and Valmiera’s per capita Olympic ranking flies off the charts. The town also excels in less sweaty ways. While the rest of Latvia struggles back after the crisis, its factories churn out stuff from fibreglass to fire extinguishers. Valmiera is home to one of Latvia’s top theatres, and a string of bars and clubs keep the students of Vidzeme University busy after school. And Valmiera is also home to a clutch of very good restaurants. Top of the food chain is Dikļi Palace. This magnificent neo-Baroque manor just west of Valmiera hosted the first ever play performed in Latvian (a translation of Schiller’s The Robbers staged in 1818 with local peasant actors) and the first song festival in 1864, and today it is showing the nation how to cook. Celebrity chef Valters Zirdziņš creates menus based around game and produce so fresh and local you can literally watch farmers offering produce at the kitchen door. Hook some “matje herring tartar, rye bread, quail egg and cream”, swim over to “sturgeon fillet prepared in citrus butter with cauliflower puree and ginger carrot” then tipple with Valmiermuiža dark beer ice-cream with raspberries and caramel. The main dining room has a hunting lodge feel and a smart casual dress code, and if that’s a bit plebeian one may reserve the private dining suite. On the summer terrace you can savour Latvian-bred steaks and magnificent views of the manor gardens. And if you can’t move a muscle after dinner, you can crash in the four-star hotel littered with antiques or enjoy a massage with beer hops in the spa. You can also find an elegant atmosphere and haute cuisine with local ingredients at Rātes Vārti. One of Valmiera’s oldest restaurants, the “Town Hall Gates” is a genteel, unrushed island in the centre of town. Park yourself in the Provencal-style dining room or the street-side terrace and feast on “fried river trout in herb butter” or “cheese parfait with black plumb tea sauce”. The restaurant’s owners also cater for big celebrations at the Brūtes (Sweethearts) events complex just south of Valmiera. A few minutes’ walk from Rātes Vārti, Liepziedi un Rozmarīns is one of Latvia’s best pizzerias. Set picturesquely between Valmiera’s castle ruins and the Gauja River in a centuries-old bakery, “Linden Blossoms and Rosemary” is a marriage between fine Vidzeme produce and the Žentiņš family’s love affair with all things Italian. You won’t find any pineapple or pickles here; only traditional toppings are used and the pies are baked to crispy perfection in a wood-fired oven. The “Al Salmone” and the “Frutti di Mare” are especially scrumptious. 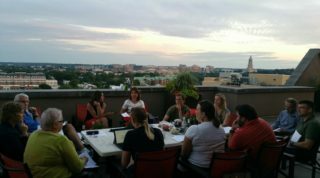 In summer groups of ten or more can attend the “pizza school” at the owners’ property “Vīnkalni” near Valmiera, where you learn to roll dough and sprinkle cheese amidst the rolling hills and storks’ nests. Of course, you get to eat your creations and a coffee and tiramisu are included too. Compared to other towns its size, Valmiera positively buzzes after dark. It even has its own theatre restaurant, Ceturtais cēliens, in the basement of the Valmiera Theatre. Joyfully mingling thespian nostalgia with voluptuous seventies furnishings, the dishes at “Act Four” like “beef-mushroom stroganoff in brandy sauce” and “dark chocolate mousse with strawberry soup” also sound a bit flared and side-burned. 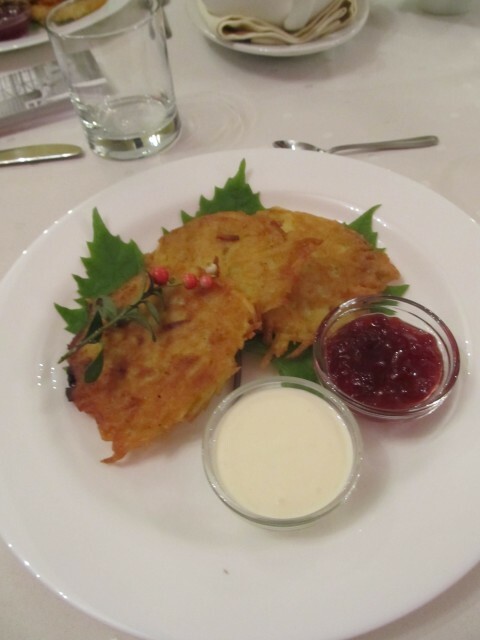 But an occasional time warp can be fun, and the potato pancakes we devoured last visit were outstanding. If you want to chew to a different beat, bop over to the Parks jazz club. On nights when Latvia’s top jazz, blues and rockabilly outfits play you won’t care if the food is cold (and you’ll be lucky to find a table), but when things quieten down they do nice lasagna and ribs. Potato pancakes at Ceturtais Cēliens. Photo: Philip Birzulis.